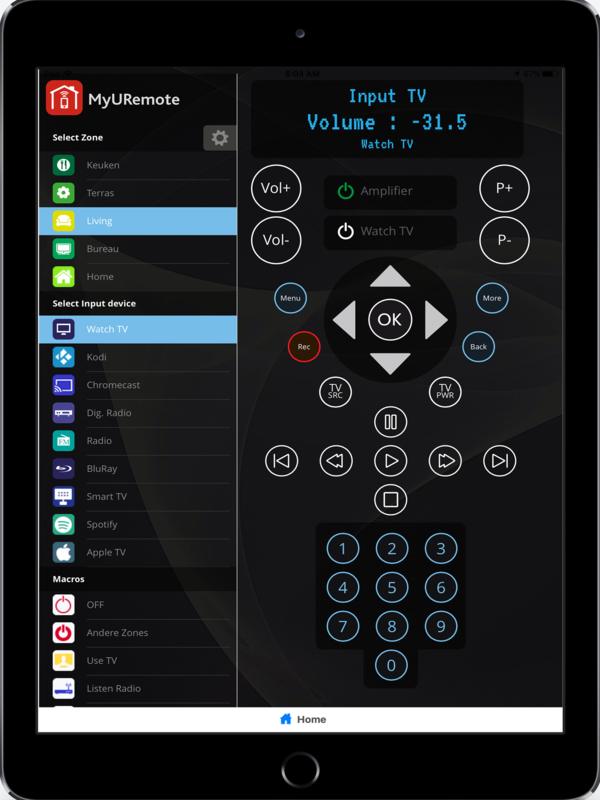 MyURemote is an extremely powerful and configurable smart remote app with a personalized and easy to use interface. It supports a wide variety of remote control systems, from your phone’s built-in IR blasters as well as RS232, IR Global Cache, and direct IP control of your devices. The app features a configurable interface with options such as customizable macros. More than just a remote for your home entertainment system, MyURemote can even be configured for a variety of home automation tasks as well. Simplify the use of your Home Theatre system: Create your own personalized, easy to use interface. Add recognizable labels to your Rooms, Inputs and Macros, so that buttons become familiar and easy to use. Lay-out for tablet and for smartphone. Configuration compatible with IOS, Android and Windows App. Instantly activate the “device in use” remote. Direct network control (smart devices). Easy and quick setup with an online configuration panel. IR controllers support virtually any device. Automatic discovery with unmatched IP control. Add your favorite channel buttons and icons. No line of sight requirements. Integrate network camera’s within the same interface. Integrate complete 3rd party web-based applications. Free technical superb (cloud based) support. Full functionalities in one price (comes with a free PC version)! Advanced users can build their own web based interface without any restrictions. MyURemote is available for any Android, IOS Apple and Windows based devices. That means you can run it on any Android tablet or smartphone. But also iPhone, iPad, or iPod Touch users have luck. Even run MyURemote on your windows PC (freeware). 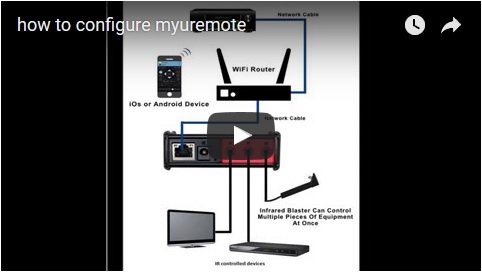 The MyURemote software can be downloaded directly from the Apple App Store or from the Google Play Store. Use your android, IOS or windows over a WiFi network and have another device convert the signal to infrared (IR) or Serial (RS232). 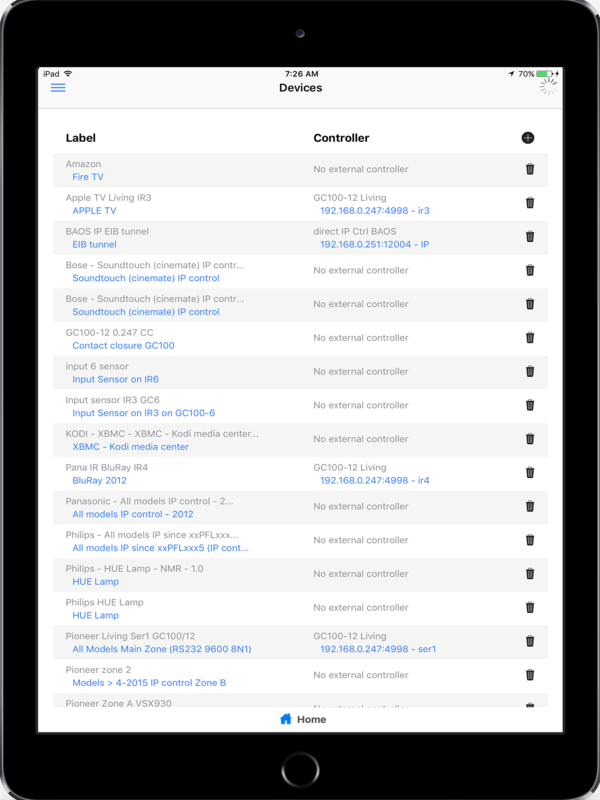 If you have any doubts or questions whether or not your device(s) are supported, MyURemote maintains a fairly expansive list of supported devices here: http://www.myuremote.com/website/compatible-devices/ From this list, you can check and see if your device can be directly controlled over IP, over IR, or via serial. You can also see if the live feedback options is available to you for IP or serial connections. 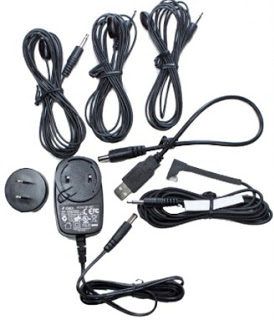 You learn an IR command via the Global Caché external adapter’s IR learning receiver port. For testing purposes, I purchased MyURemote on Google Play and purchased one of the iTach ethernet to IR adapters, which transmits MyURemote’s commands on my home network to three external infrared adapters and blasters. Since my other devices can only be controlled via IR, I used the iTach adapter to its full extent. The iTach ethernet to IR adapter is a small device that converts the MyURemote’s WiFi to IR. I chose the ethernet version, however there is also a WiFi version that will simply connect to your WiFi network making placement easy and flexible. The iTach comes with all the IR adapters you will need, including a blaster, which will send a ‘blast’ of IR signals. You can only use the IR blaster on the third port of the iTach, and you must explicitly tell the iTach via its web interface that you are using a blaster on the third port. I configured the first IR port to control my Samsung TV, the second IR port to control my Panasonic Bluray player, and used the third port with the “IR Blaster” adapter to control my remaining devices in my cabinet, which included my AppleTV and Cable box. You configure the iTach adapter via your web browser. It’s very easy. If you are connecting the IR Blaster, you must explicitly set the blaster in Connector 3 (port 3) or it will not work. One important note is that the IR Blaster is only supported on the third port of the iTach. Because the blaster requires a bit more power and can toast one of the regular IR adapters, you need to explicitly configure the third port to support the blaster. Tech Note: If you’ve never used an IR extender or blaster before, it’s initially intimidating but very easy. The IR extender is a cable that plugs into the back of the iTach and then at the other end has a small “eye” with double-stick tape. You simply affix the eye portion onto the IR receiver of your device. This then sends the IR signal directly to that device. Most devices will indicate where the IR receiver is with a small “IR” label. If you don’t see such a label, you can easily find the IR port by shining a flashlight onto the face of the component you want to control. If you ever get stuck, MyURemote support is there to walk you through the process. MyURemote is very, very powerful yet you are immediately presented with a simple and easy-to-understand interface. MyURemote works along the following four concepts or levels. MyURemote’s interface is designed across these levels. Once you understand these, the rest is easy. Which devices do you want to control with MyURemote? Thousands Devices are Supported: our compatibility lists are constantly being updated with new devices. Check the tables to see if your device is listed. If your device is not in our database yet you can add it yourself. If all your devices support IP control. : You don’t need a controller! Goto Step 3. 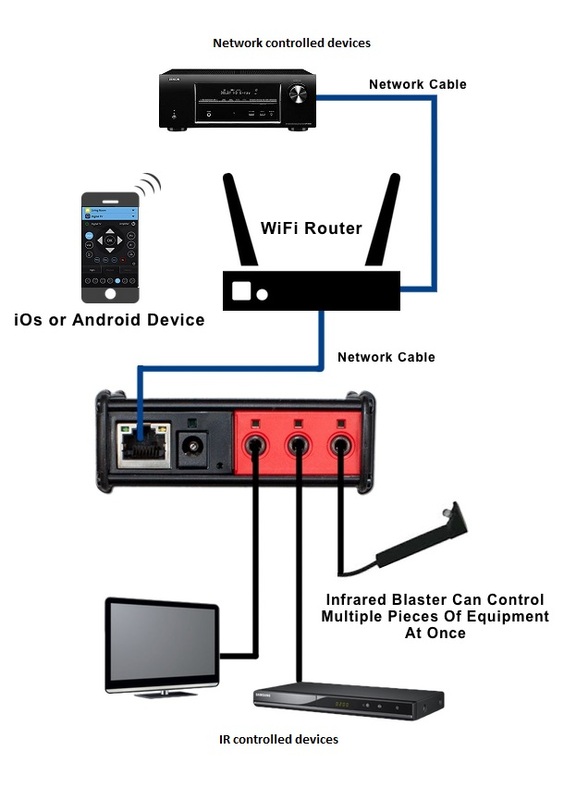 If your smart device has an internal IR blaster (IRDA), the ‘IR blaster controller’ is automatically added to your configuration and ready to use. If one device only supports Infra-Red or Serial(RS232) you need a iTach controller. If you need unlimited (IR and Serial and Contact-closure) control you best buy one GC100 controller. Step 2 – Define your controllers (only if you need IR or Serial control). Open the configuration panel, click on “Settings”. MyURemote discovers your network looking for your devices and controllers. Step 3 – Define your devices. Click on “Devices”, “Add Device”-icon. If your device is not in our database: don’t worry, you can add it yourself. Enter the IP address or assign your device to a port on one of your extenders. Step 4 – Define your ZONEs (= rooms , or subdevision for special functionalities, or a remote for domotics,…). For layout “Audio/Video”, first assign your amplifier!!! Assign your devices to input buttons on your remote control. For years, I’ve been looking for an Android-based remote that could take the place of my multiple Logitech Harmony remotes. Until MyURemote, all the contenders I’ve previously tried or considered have fallen short. In fact, all other solutions in comparison look like pretenders, not contenders. MyURemote is the first Android remote control that will not only fully replace your previous universal remote solution but make it so easy that you’ll never look back. MyURemote is reasonably priced, powerful, has support for a wide variety of devices and even supports home automation systems. Best of all, the ability to update settings across multiple iPhones and iPads, android and windows instantly seals the deal. If you don’t want to spend thousands of dollars with proprietary solutions that require custom installation, then MyURemote is the best game in town. 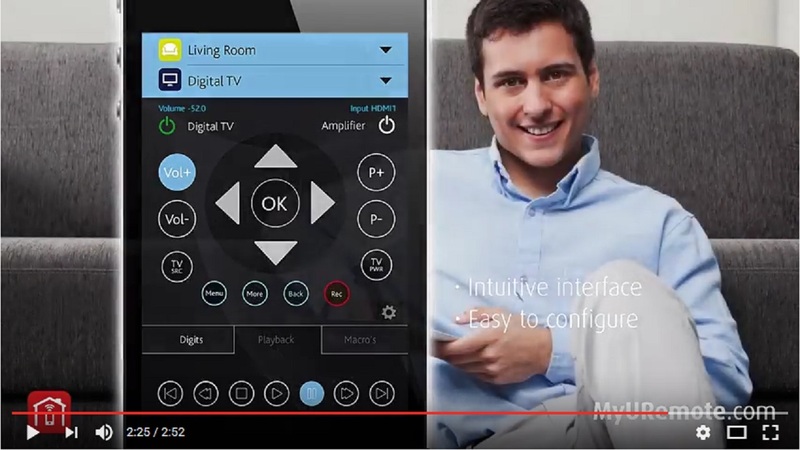 Can MyURemote use the IR built into the Samsung Galaxy Tab3 7″ and Galaxy S4 Phone? MyURemote supports the Android IR blaster for Samsung, and for ALL android 4.4 devices! Also note that, and that is exclusive MyURemote, you can combine your IR blaster with IP control to get feedback from your devices. What do I need for home automation control? Baos 771 and Baos 772 gateways for KNX. When you use a Global Cache for your AV, you can combine it with a RS232 to KNX convertor such as ZENNIO SKX Linker. Click here for more information how to connect with your Zennio . (this manner allows you to have already a complete interface for your home automation system for 300€). To use the app with BTicino MyHome: My URemote can send commands, using the “open web net” protocol to send commands directly to the IP address of the MH200. Can I use other controllers than Global Caché? basically MyURemote supports all controllers via IP control, but we can only guarantee correct operation with Global Caché. The Baos 771 and Baos 772 gateways for KNX. When you use a Global Caché for your AV, you can combine it with a RS232 to KNX convertor (such as ZENNIO SKX Linker). Here you find info about the protocol used for universal domotics communication. To use the app with BTicino MyHome: My URemote can send commands, using the “open web net” protocol to send commands, directly to the IP address of fi the MH200. IP controlled domotics processors or controllers: advanced users can find here info about the control and vizualization of a home automation system by using a control processor and MyURemote. How to change the interface? How to create macros and scenarios? What if my device is not supported? If your device is not in our devices database, you can add it yourself. However, this is a rather technical process. You will need to know the command codes of your device. If it is an IR device, you can capture the IR command codes with an IR reader (tutorial). Ask your local audio-video or domotics dealer. He should be familiar with MyURemote. How is this app useful for audio video and home automation dealers? Being able to provide your customers with an affordable way to control a new device with tablets and smartphones is a real asset nowadays. It will increase your sales instantaneously! Furthermore, MyURemote can replace sometimes expensive brand specific remote controls. You can create accounts for your customers on the configuration panel and test with your own tablet or on your Windows PC. There are no costs involved. We allow you to put your own Logo on the interface. Your customers can istall MyURemote on one or more mobile devices and logon with the account data you created for them. MyURemote supports control using 3 manners of communication: IR, serial and IP control. 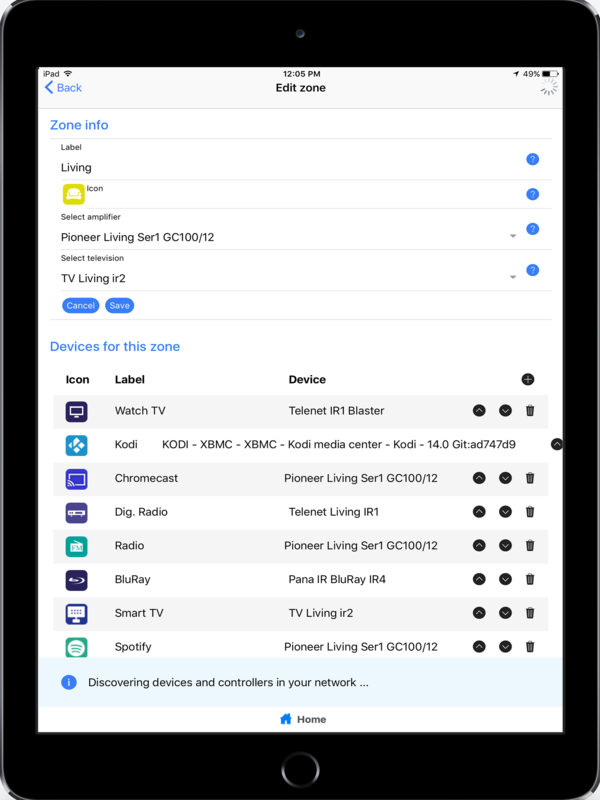 Controlling devices directly via IP control requires that your smart device and your component can communicate over your Wi-Fi network. A key advantage of IP controllable devices is often that they provide additional feedback not possible via infrared because the IP connection is bi-directional. No controllers are required for IP control. Controlling devices via serial (RS-232) is enabled by a Global Caché controller such as the IP2SL or WF2SL. If needed based on the target device, configuration of serial port settings such as baud rate should be performed via the IP2SL/WF2SL web interface prior to usage. Most electronic devices, controllable via RS232, are also controllable via IR but RS232 is bi-directional and the connection is faster. 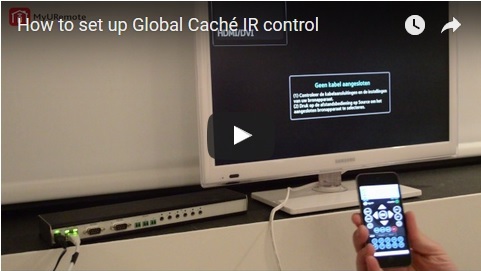 Controlling devices via IR (infrared) is enabled by a Global Caché controller such as the IP2IR or WF2IR. Our list of supported devices is growing every day. You can find it if you logon to the configuration panel and click on “devices database”. If your device is not yet in our database, you can add it yourself. In this tutorial (very bottom) you find a list with recently added commands. Can I use MyURemote on more than one tablet or smartphone? Your configuration settings are stored in our online database. If you login with your credentials on a second (or third, fourth…) device, MyURemote will act exactly the same as on your first device. First download of your settings can cause a slight delay, but once your settings are downloaded, there is no further need for connection with our database.